The violin is the smallest and highest pitched stringed instrument used in western orchestras. It has four strings, pitched G-D-A-E (from lowest to highest), which is an arrangement of the Circle of Fifths. The 'A' is pitched to Concert A at 440 Hz. Typically, a bow (arco) is drawn across the strings to produce a sound on the instrument, and a wide variety of bowing techniques can provide unique sounds, such as the bouncing spiccato or the broad legato. The strings may also be plucked, similar to a mandolin or guitar (pizzicato), but only by the flesh of the finger (not with the aid of a plectrum). An orchestra will typically contain two violin sections - a First and Second. Today the First Violins are usually situated at the front of the orchestra, immediately to the conductor's left. The Second Violin section will be located adjacent to the Firsts. While there is no specific purpose for each section, the First Violin section will generally be given the melody in a musical work, and will generally play in a higher octave than the Seconds. The Seconds will either double the melody in a lower register, harmonize the melody, or contribute an effect to layer the orchestral sound. The instrument developed in its current form the mid 1500s in Italy. Before the mid-fifteenth century, violins typically had three strings and had been used is in China, India, and the Middle East. The first four string violin was made by Andrea Amati. The most famous makers of violins include G.P. Maggini (1580-1632), the Amati family of Cremona (1500-1740), the Guarneri del Gesù family of Venice (1626-1744), Jacob Stainer of the Austrian Tyrol and, above all, Antonio Stradivari. The violins by those makers are very highly regarded and still used by the greatest players. 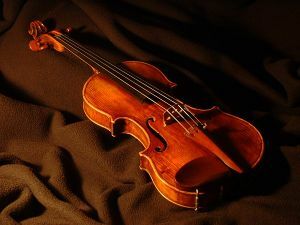 Almost all new violins are made to follow the patterns of these old masters, although some adaptations have been made to support the metal strings and higher pitches of modern performance, most significantly lengthening the neck of the violin. Famous violinists include Niccolò Paganini, Joseph Joachim, Jascha Heifetz, Sir Yehudi Menuhin, Itzhak Perlman, Isaac Stern, Joshua Bell, Nigel Kennedy, Hilary Hahn, and Igor Oistrakh. The violin is also used in folk and popular music and is traditionally called a fiddle. It is just as valid a name as "violin"; in fact both words have a common origin: both derived from the Latin vitula, by separate paths. Because it is often used to accompany dance, it gained the nickname 'the devil's instrument'. In fact, the violin has always been used for both sacred and secular music. It has spread throughout the world and everywhere it goes it is adapted to the local musical styles. Before the widespread use of synthetic materials, violins used strings made of a fibrous material called catgut. Catgut is derived from the intestines of sheep - not cats, as implied by the name. In modern times, most violinists prefer metal strings, typically a nickel core wrapped with an alloy to prevent corrosion and to achieve a desired tension; it's also not uncommon for a violinist to use a gold-plated or gold-cored E-string to provide a richer tone in the highest registers of the instrument. A small group of violinists, particularly those involved with recreating and reviving traditional Baroque sounds, will opt to play with the older catgut strings. While it is regarded as the smallest of the string family, there are even smaller versions intended for instruction for children. The violin is normally played by drawing a bow across the strings. Vibrato is a technique were the violinist creates a pulsing rhthym with the left hand. By moving the parts of the left hand and arm the pitch of the note varies slightly. Vibrato is often added to violin parts for different effects. Earlier music, most notably in the Baroque period, used very little vibrato, while most modern music uses vibrato extensively. A double stop involves playing two strings simultaneously, producing notes of a chord. Three and four strings may also be played, producing triple and quadruple stops, respectively. Harmonics are produced by lightly touching a harmonic node with the left finger. This creates a higher pitch sound than would normally be produced on the string. Harmonics are found at even intervals along the string; the second harmonic is at the halfway point on the string, the third harmonic is at 1/3rd intervals, and so on. In addition to playing techniques achieved mostly with the left hand, there exist several different bowing techniques that can be achieved with the right, bowing hand. Pizzicato refers to plucking an open string with the right hand, rather than drawing the bow across the string. This is often marked in music by the word pizz. Some string instruments, such as the harp are played exclusively by pizzicato. Spiccato is a bowing technique where the bow is bounced lightly on the string. The bow is held above the string, and the resulting bouncing produces short, distinct notes. Spiccato is often used in fast passages so individual notes can be heard distinctly. Bruch - Concerto No. 1; Concerto No. 2; Concerto No. 3; Scottish Fantasy. This page was last modified on 26 December 2016, at 10:11.